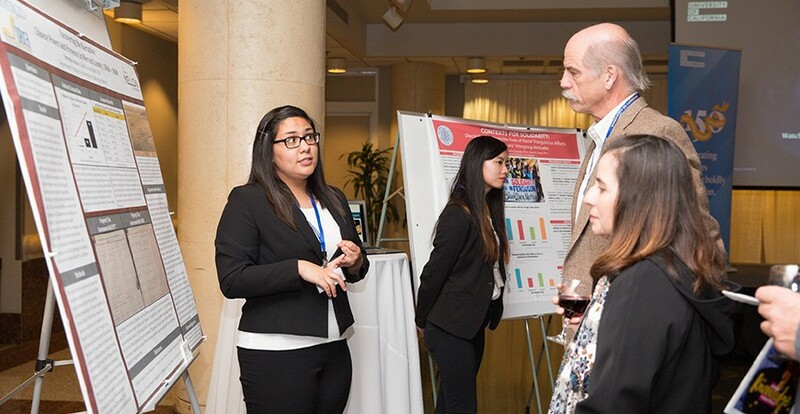 Verenize Arceo (far left) presents her research in Sacramento during an event that showcased undergraduate research. 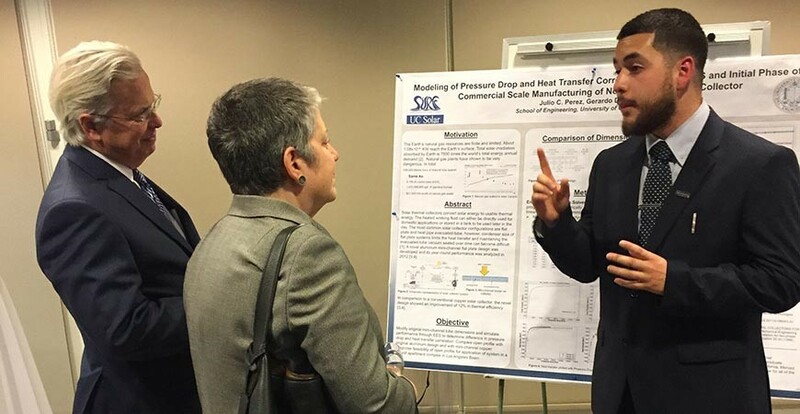 Two UC Merced students were among a group of 22 University of California scholars who presented research to alumni, lawmakers, President Janet Napolitano and others to demonstrate how they are creating new knowledge while gaining valuable experience. Verenize Arceo of Winton and Julio Perez of Hayward, both fourth-year students, joined 20 other undergraduates from across the University of California in Sacramento on Feb. 26 for the undergraduate research showcase. The event was part of a series of celebrations to observe UC’s 150th anniversary and highlight research opportunities available to undergraduates. Arceo, a history major, is using old records to piece together a vanished part of Merced’s County’s history — a Chinese community that was among its earliest settlers but is absent from history books. Early census data for Merced County show that the Chinese community grew from 13 people in 1860 to 581 by 1880. Records show them buying and selling land, an indicator of money and power. But newspapers written at the time made little mention of the population and historical records are equally elusive. Using limited information from available records and supporting data like real estate bills of sale, Arceo is reconstructing that community’s history. Julio Perez, on the far right, presents research to UC President Janet Napolitano. In his work as a research assistant at UC Solar, mechanical engineering major Perez is part of a team working to create innovations to further and improve renewable energy. Working under the guidance of Gerardo Diaz in the School of Engineering, Perez is part of a research team that has designed and tested a novel solar thermal collector that could replace natural gas for heating water in homes. The aluminum used in the collector is both cheaper and more efficient than the copper currently used in commercial production. “The passion and experience I’ve developed by being able to participate in this research is something that I’ll always take with me,” he said. Arceo and Perez also participated in the 2017 Summer Undergraduate Research Institute hosted by the Undergraduate Research Opportunities Center (UROC). Arceo is a UROC-H scholar funded by the Andrew Mellon Grant for research in the humanities. Perez, participated as a Summer Undergraduate Research Fellowship (SURF) fellow, which is funded by the Office of the President. To learn more about undergraduate research opportunities at UC Merced, visit uroc.ucmerced.edu.